The repurposed writer: An ordinary life? No. A thousand times no. 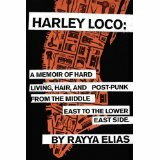 I was asked to review Harley Loco, a memoir written by a gay ex-junkie hairdresser who was born in Syria and made her way to the drug capital known as the East Village, N.Y. (via Detroit) where she made her name as a hairdresser/punk rock musician (yes, musician and hairdresser) while skipping, like Dorothy going to Oz, through all the rungs of junkie hell. I didn’t want to read this book. First of all, I have personal knowledge of the Christian/middle-eastern family structure and any one of this brave girl’s trifecta of secrets would take her out. For myself, a book about a world-class junkie who was also a world-class hairdresser? No. I was going on a long train ride and it was on my Kindle so I took a peek. I was surprised to see a preface by Elizabeth Gilbert of Eat, Pray Love, a memoir I found difficult to swallow whole hog. Yet I was intrigued by Gilbert’s unabashed adoration of Ms. Elias and her book. There are people who don’t want - can’t stand - an ordinary life. I know what that feels like. Rayya Elias, the narrator of this absorbing memoir could not tolerate being ordinary. If Eat, Pray, Love varnished the truth to make a good story, Elias left her truth beautifully unvarnished in Harley Loco and wrote a compelling memoir that pulled me in completely. Elias is a brave soul who is a magician at yanking her life out of the fire just as it begins to look like a descent into hard misery or worse. It’s like reading a book version of The Perils of Pauline except Elias’ perils are heartbreakingly real. With memoirs of the harrowing kind, you want to see redemption, you want a happy ending. This impressive memoir of a gay Syrian hairdresser with a musical bent whose demons come close to destroying her countless times is the happiest of endings.